Messages is arguably the most useful communications tool on your iPhone. What started as a way to make SMS text conversations easier to follow has blossomed into a full-fledged communication powerhouse. And in iOS 8, Messages is better than it's ever been. 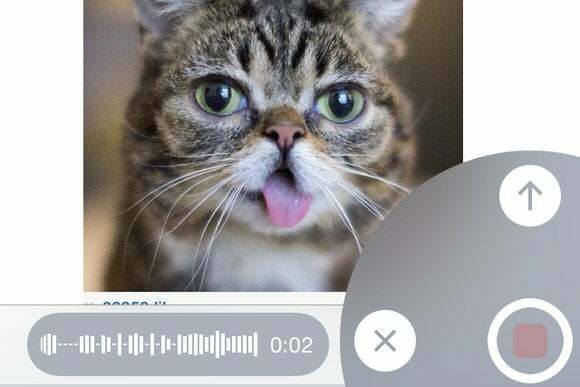 Ironically, one of its best new tricks is the equivalent of leaving an old-fashioned voicemail—only now that's way more useful because it lives alongside the texts, photos, videos, and shared locations you keep in Messages already. Let's walk through what's new and cool in Apple's chat app. Constantly tapping out texts in Messages is the exact exercise the Surgeon General recommends for injuries to the thumb tendons—OK, that's not true. But it is true that, in iOS 8, you don’t have to use your thumbs to let someone know you’re thinking of them. You don’t even have to send words. To the right of the box where you would type a message, you’ll see a microphone button. 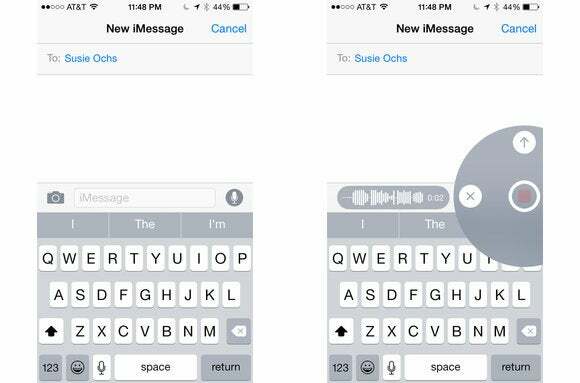 (It’s not the microphone next to the space bar that you'd tap to dictate a speech-to-text response; it’s a new microphone, in a gray circle.) Tap and hold that and you can make an audio recording. When you lift your finger up, the recording stops, and you can press the Play button to listen back to it if you want. Then just tap the Up arrow to whoosh it off to the recipient, or the X to trash the recording. If you don’t care about listening back to your ramblings before sending, you can even just swipe your finger straight up from the recording button to send it immediately. While most of your messages will probably be short, you can ramble pretty long. I sang the overture to Candide into an audio message for a good 2 minutes and 19 seconds before my finger slipped off the button. Once you’ve stopped a recording you can’t add more to it—you just have to start a new one. To listen to an audio message, you can either just lift your iPhone to your ear to hear it privately, or tap the Play button to play it over the speaker. Recent photos, ready to send! 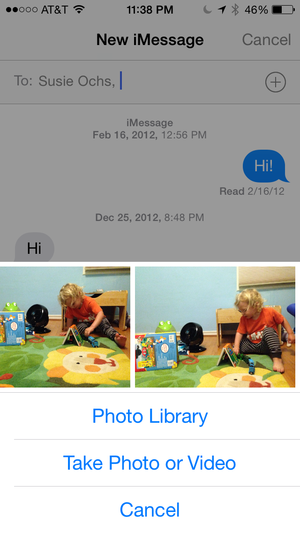 Sending a photo is a piece of cake in iOS 8. When you tap the photo button, the last few images you took are automatically displayed in a scrolling row at the top. 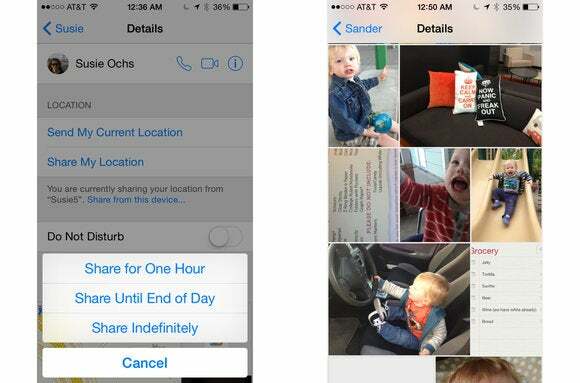 This will save you a few taps if you’re trying to send a picture you just took. To pick an older image, just tap Photo Library. The option to Take Photo or Video isn’t new, but now you can trim video clips before sending them, by sliding the start and end points around. But there’s a quicker way to send photos and videos that is new. Instead of tapping that camera button once, tap and hold it down. That quickly launches the camera, and you can slide your finger up to take a photo or to the right to start a video. It only shortens the process by a tap or two, but when you’re trying to capture the moment, having such shortcuts right in the Messages app is nice. If you click the Details link at the top-right of a Messages conversation, you'll find some other new tricks. You can send your location, as a pin on a map, or even share your location, which updates the map everytime the recipient looks at it. The Details screen lets you share your location, see all attachments, and even temporarily suspend notifications on a per-conversation basis. The clever Do Not Disturb feature built into Messages is great if you’re in a chatty group conversation and you don’t want your phone to blow up every time anyone in the group responds with a “Me too!” or a “LOL.” The messages will just pile up until you get a chance to look at them; you can always flip the Do Not Disturb switch off if you want to start being notified of new messages in that conversation thread. You can also delete people from a group conversation individually—a feature I’m sure won’t be misused by any mean middle-school students. When it all gets to be too heavy, a handy Leave Conversation option at the bottom lets you back away slowly and not be bothered again—until the next group convo, that is. The Details screen also shows all the attached photos, videos, maps, and audio recordings you and another person (or group) have ever sent to each other. If you have message threads going back years with people, it’s a fun way to quickly see all the photos you’ve ever shared.